Some months ago, I reviewed a paper about the efficiency of human space exploration versus robotic space exploration. Dispelling the myth of robotic efficiency: why human space exploration will tell us more about the Solar System than will robotic exploration alone by Ian A. Crawford. The question isn’t as simple as you might think. Both have their advantages and disadvantages. Human exploration is very costly due to the necessary good of getting humans to return to earth, and the life support system that needs to be put in place to keep them alive in space; whereas robotics can, in principle, be left not to return, and can spend many hundreds of days on a foreign planet surface. So what are the benefits of human space exploration if it’s so costly and adds increased difficulty? Well, humans are more flexible. They’re more mobile due to their size and ability to take bigger transportation. They’re much more efficient in collecting samples, be it rocks or other samples. They’re much more adept at large scale exploratory activities; traveling even hundreds of kilometers in a single day. So, of course, that’s just a qualitative assessment as the paper states. Robotics has been improving, but the paper includes several figures that have more of an objective assessment as to the human versus robots question. Let’s first go to Figure 1, which is one of my favorites; it’s a table, Summary of Skills of Humans versus Robots, and we see that the balance of the advantages lie with humans. Robots are more expendable, slightly more reliable, have increased sensory acuity in certain respects and once programmed, they are very precise. Of course, this is again qualitative. Let’s go now to Figure 2. 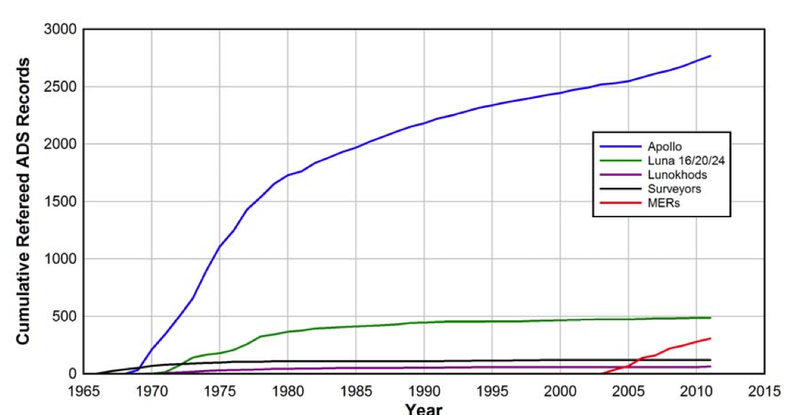 Figure 2 depicts the cumulative number of refereed publications for the various missions. Apollo, of course, is the human mission, and we can see that there are citations completely dwarfing theirs. I think this comparison is a bit unfair. The author makes the case that Apollo’s success is in part due to all of the sample collection that has been enabled by the human explorers versus the robots. They could in principle send robots with the intent of having them return. That doesn’t necessarily save us as much money as the expendable nature that the robots originally did. But this still doesn’t get around the fact that robots are limited to the amount of material they can return based on their size. Robots have been getting bigger and bigger and bigger in terms of the robot sent to Mars, and we can clearly see that this also is associated with an increased expense. The smaller robots are simply more prone to getting stuck and it takes them forever to travel. They cannot return as much material. So, we can see the robot size is increasing, and so that’s not saving as much money, and also, if we were to return samples you would not save as much money either. So, as a more fair figure, Figure 3 actually normalizes by the cumulative number of refereed publications per day. We can see again, Apollo is the most efficient. So, we can see also that the mission costs for Mars landers are going up over time instead of down. This is again due to the increased size. Checking out Figure 4, also note that this figure is not inflationary. It’s simply that the requirements of the robotics are getting more intense if we want to actually do the science. Figure 5 shows a cute little picture of the gradually increasing in size of the robots. The author makes a decent case for the fact that human explorers are in, fact, not as costly as they might seem. In addition, makes the final case that human exploration is largely subsidized by geopolitical concerns, or has been in the past. The scientific budget fraction for human space exploration is as little as 1.2% of the total Apollo budget, or $2.09 billion exactly. That means that, if there are geopolitical concerns for human space exploration, say in humans to Mars, that humans can get a huge bang for their buck as opposed to robotics by jumping on that repurposed military budget, taking in space exploration and catching a small tiny percentage o it, 2 to 4% would be huge, and we could get lots of new science done for that. In conclusion, I think the author makes a decent case for human space exploration, but I wish that they would have also perhaps addressed the concern of humans and robots working together (rather than pitting one vs. the other) and addressed the concern “if you make a robot that’s simply big enough and designed to return samples, can we indeed make a robot that has as big of bang for its buck as humans” . Finally, the consideration of geopolitical issues may no longer be relevant in today’s world. Of course, China and India are up and coming, but companies like SpaceX and Orbital are showing that, perhaps private industry or industrial concerns, versus geopolitical concerns are the new things to piggyback on of the future. Of course I’m biased. I’ve applied to be a NASA astronaut. Nonetheless the future looks great for human space exploration–for humanity and for science.